The reticulated python epitomizes the saying "go big or go home" to reptile owners. The anaconda may get credit for being the world's largest snake, but the reticulated python is the world's longest. Native to Asia, this snake can grow up to 30 feet or longer and weigh in at 350 pounds. Medusa, a reticulated python from Kansas City, MI, holds the Guinness World Record for longest snake in captivity, measuring 25 feet and 2 inches. Most reticulated pythons kept as pets stay in the 10 to 20 feet range, with females growing larger than males. They enjoy a range of beautiful colors, from olive green to gold to tan across the diamond-like pattern from which they get their name. Perhaps the most beautiful are the albino reticulated pythons, which can be white, lavender, and purple. Reticulated pythons are known for having a nasty temperament in the wild, but captive-bred "retics" can make great pets with the proper care and handling. Because of their personality and sheer size, reticulated pythons are only recommended for those with experience raising and caring for snakes, especially those who have owned other large snakes. A reticulated python should be bought young from a reputable breeder or pet store, and it is very important to handle the python early and often to build up trust between snake and owner. A retic bites when it is scared, so you should make sure the snake is active and alert before handling and not risk startling it awake. Reticulated pythons are known for their love of eating, so wash your hands before handling to avoid the retic mistaking your fingers for food. You should also show the snake your empty hand before picking it up, and it can be a good idea to pet the snake prior to picking it up to ensure a calmer reptile. Young retics will have a greater tendency to bite, which will reduce as they gain more trust of their owner and become acclimated to handling. When holding the young snake, keep fingers closed and palms flat to give less opportunity for bites. As you can imagine, the longest snake in the world will need some room to stretch out. But it is best to keep your reticulated python in a smaller 10 to 15 gallon tank or vivarium when little, moving it to a larger tank or cage as it grows into adulthood. A full grown reticulated python needs housing 3 feet wide, 6 to 8 feet long, and 2 feet high. Unless you have multiple tanks of varying size, you will need to transfer the python to the larger enclosure before it reaches 10 feet. A 10 to 15 gallon vivarium is fine up until around three feet in length. When moving the python to the larger housing, remember that the retic can become intimidated if given too much space. The larger cage or tank should be fitted with rocks, plants, hides, and other decor to make it seem smaller. 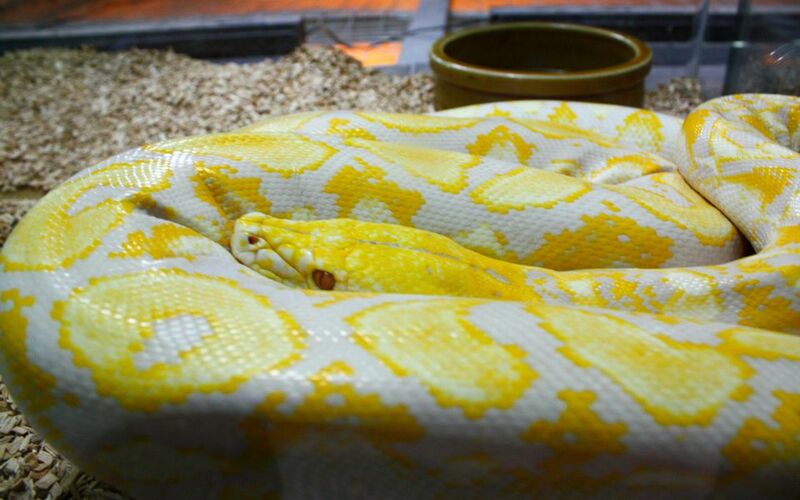 When dealing with retics smaller than 10 feet, a good rule of thumb is for the length and the width of the cage to equal the length of the snake, so housing that is 3 feet wide by 4 feet long is good for a 7 foot long reticulated python. No matter if it is a small vivarium with a young python or a bigger cage with a full-sized retic, the snake needs a place to be alone and undisturbed, so all housing should be equipped with a hiding spot. For the young snake, this can be a small box with an opening, but larger retics may need something a bit more rugged like a hollowed out log or custom hiding spot. Most retics will achieve 10 feet in length within 18 to 24 months of age. The python will also need a dish of drinking water. The dish need not be very big, but should be secure. As it grows, the reticulated python will become quite strong, so everything in its environment will need to be solid. The bottom of the housing should be lined with an appropriate substrate for bedding, such as newspaper, paper towels, or cypress mulch. However, pine and cedar mulch should be avoided because they are toxic to reptiles. The cage or enclosure should be maintained at about 80 to 85 degrees with at least one basking spot that is 88 to 92 degrees Fahrenheit. Having spots with multiple temperatures in the housing will allow the retic to balance its own temperature. There are a number of acceptable heat sources such as pig blankets, heat pads, ceramic heaters, hot rocks, and basking bulbs. Your young reticulated python may not care for frozen or dead food, so be prepared to feed it a steady supply of live animals. In fact, your python may never take to eating anything that isn't living, but most retics can be eventually trained to accept frozen or dead food. The basic rule of thumb for feeding is to give one animal roughly the size of the snake's diameter once a week. The retic can easily go two weeks between feedings, but it is best to keep stretches without food to 7 to 10 days at a maximum. It's also very important not to feed the python too often. While overfeeding will help it grow quicker, it will also grow unhealthy and could suffer major health issues going forward. Live food can be simply dropped in the housing, but frozen food should be warmed. Your retic isn't going to enjoy an animal popsicle. You can thaw frozen food in warm water before handing it over to your snake. Avoid using a microwave or any heating source that may cook the food internally. Increase the time between feeding from 7 to 10 days to ensure a healthy appetite. Try feeding your reticulated python at dusk when it is becoming more active. Be careful not to force dead food upon your retic. If the snake will not accept the food, go back to live food for a week or two. Use tongs to deliver the food, imitating a live animal by moving it slightly, but avoid putting the food right in your snake's face. Pushing: This is a behavioral problem rather than a health problem, but it can lead to health issues. Reticulated pythons that regularly push their head against their cage or vivarium can injure themselves, causing the head to swell or other issues such as mouth rot. If pushing is noticed, clean out the cage and check to be sure the temperature is right. Retics tend to push when they are uncomfortable. Pneumonia and Other Respiratory Diseases: A common ailment among reptiles that is often caused by the temperature varying or becoming too low for a long period of time, respiratory issues can sometimes be detected by wheezing. As it advances, the disease can cause the snake to secrete a cheesy substance. Parasites: Snake mites and other parasites can cause problems with any snake, so it is best to clean their housing on a regular basis and always wash hands both before and after handling. Inclusion Body Disease: IBD is a deadly virus that can affect pythons and boa constrictors. Signs of the disease include the inability to constrict and the snake being unable to right itself when turned over. It is easy to choose based on coloring, and there are a number of wonderful color combinations when it comes to reticulated pythons. First and foremost, you want a healthy pet! The snake should be alert with tongue flickering. The eyes should be clear, although they may be milky before shedding. There should be no visible cuts or bruises on the snake. Check to ensure there are no sores on or around the mouth or bubbles coming from the nose. Choose a well-tempered snake. Retics are notorious for being defensive while young, but given a selection, the calmest of the bunch might be the best choice. Otherwise, check out other types of reptiles and amphibians that can be your new pet! How Do You Care for a Pet Red Tail Boa? How Do You Care for a Pet Boa Constrictor? What Are Ball Python Lighting and Heating Needs? Is it Better to Feed Snakes Pre-Killed Prey or Live Prey? What Size of Prey Should I Feed My Pet Snake? What Types of Snakes Make the Most Popular Pets?